Eton Mess is a delicious combination of fresh strawberries, broken meringue cookies, and lots of lightly sweetened whipped cream. Its name "Eton Mess" pays tribute not only to the place where it was invented, Eton College (which is one of Britain's most famous public schools whose alumni includes 18 Prime Minister's of Great Britain), but also to the fact that the cream, strawberries and meringue cookies are all just mixed together in one big bowl that looks, frankly, like a bit of a mess. This is a dessert that I like to assemble shortly before serving, so the pieces of meringue stay nice and crisp. So let's talk about each of the three components of an Eton Mess. First, the meringue cookies. While you can use store bought, I really like the flavor of Homemade Meringue Cookies. They are so airy, sweet and crisp that seem to just melt in your mouth. The outsides of the meringues are nice and crisp, yet the insides remain wonderfully soft and puffy, almost like a mini-Pavlova. 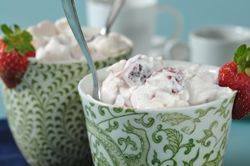 You can use as many cookies as you like in the Eton Mess, so use the recipe as a guide only. Next, the strawberries. For maximum flavor, make this dessert when strawberries are in season. When buying strawberries, look for ones that are bright red, plump, firm, with no white or green "shoulders" at the stem end. The green leaf-like cap or hull should still be attached and it should not be brown or wilted. There should be no soft spots, bruising or mildew. Always check the underside of the container to make sure there are no squashed berries or juice (sign of overripe berries). If not using immediately store in a single layer on a paper towel-lined tray in the refrigerator. Finally, we need to whip the cream. Cream is a very important part of this dessert as it binds everything together. Cream is the fat that rises to the top of whole milk. It has a smooth, satiny texture and is labeled according to its butterfat content (heavy to light). When making an Eton Mess use 'Heavy' Cream or Heavy 'Whipping' Cream which means it has a 36 - 40% butterfat that will double in volume when whipped and hold its form. Meringue Cookies: Preheat your oven to 200 degrees F (100 degrees C) and place the rack in the center of your oven. Line a baking sheet with parchment paper. Before placing the cookies on the cookie sheet, place a little of the meringue on the underside of each corner of the parchment paper. This will prevent the paper from sliding. Then, using two spoons, place 10 equal sized mounds (about 23 grams) of meringue onto the prepared baking sheet. Bake the meringues for approximately 1 1/2 to 1 3/4 hours. The meringues are done when the outsides are dry and crisp and separate easily from the parchment paper. Turn off the oven, open the door a crack, and leave the meringues in the oven to finish drying for several hours, or even overnight. Makes about 10 - 2 3/4 inch (7 cm) Meringue Cookies. Strawberries: Place about one third of the strawberries and the sugar in your food processor and process until just pureed. Alternatively, you can crush them with a potato masher or fork. Cut the rest of the strawberries into bite size pieces and place in a large bowl, along with the pureed strawberries. (Can be made about one hour before assembling the Eton Mess). Eton Mess: Break five to six meringue cookies (use more or less if you like) into bite size pieces. Then fold the strawberries and meringue cookies into the whipped cream. Serve immediately. Serves 4 - 6 servings.